Warm & Natural Cotton Batting from The Warm Company. 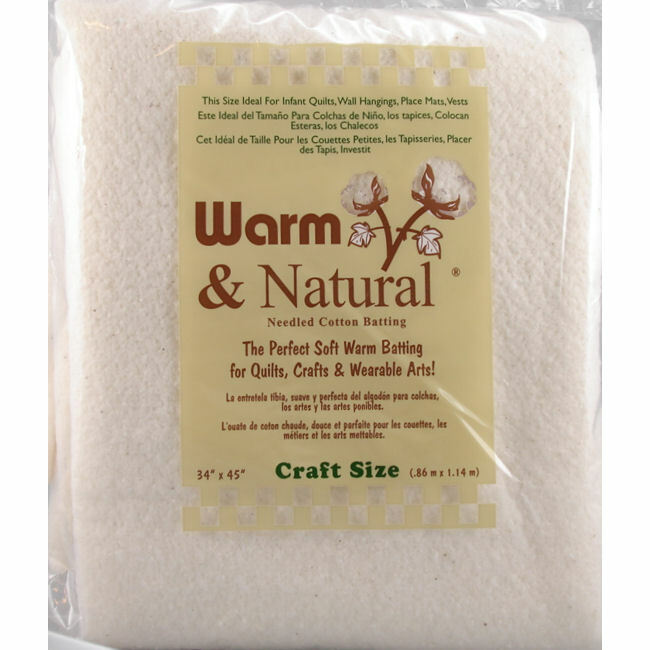 The Craft Size Warm & Natural Cotton Batting measures 34 x 45 inches. An ideal natural cotton quilt batting! Natural cotton fibers are processed using a needlepunch technology without chemicals, glues, or resins. Batting is easy to work with and will not bunch or separate. Quilt or tie up to 10" apart. Batting will keep it's shape through repeated washings. Your completed quilt project will have a natural antique look. This is a high quality batting that will provide lasting value for your quilt and craft projects. Use for a variety of creative craft projects, including baby quilts, wall quilts, and more! • Craft Size 34" x 45"